● Customers can save on shipping by choosing $5 Best Way Select Shipping, which is a flat rate for economy shipping to all 50 states. ● The $2 Sale lists thousands of items priced at $2 or less, with discounts reaching over 90% off regular prices. ● The Big Box Blowout Sale page offers discounted jewelry supplies marked down by as much as 75% off regular prices. Other great deals can also be found in the Smart Bargains section. ● Fire Mountain Gems and Beads offers larger discounts for multiple quantities of a single item and even assorted items through its All Assortable pricing scheme. Visit theBulk Buys section for wholesale prices on volume orders. ● The Jewelry-Making Contests page lists several jewelry design competitions the company regularly holds. Winning designers can win up to $1,000 worth of gift certificates and be featured on the company’s online gallery, catalog and social media pages. The company’s Facebook page has also been known to offer gift certificate giveaways for its Facebook Fans promotions. 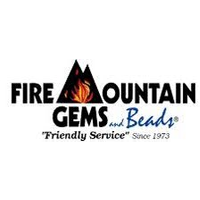 Fire Mountain Gems has been in business since 1973, providing discounts on beads, gems, and jewelry components ever sense the very first day that they opened up for business. Their online products catalog has hundreds of thousands of individual pieces available already, with thousands more being added each and every year. The majority of the products that they make available are sold in bulk quantities to increase the amount of savings even more than usual, but individuals that sign-up for a free membership account with this platform are going to be able to take advantage of the most substantial discounts. For most up to date offers check out Fire Mountain Gems on Facebook and Twitter or contact Fire Mountain Gems Support for any questions.